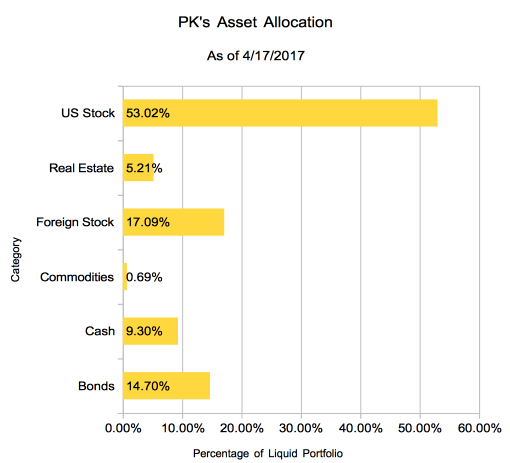 Navigation: Home » Personal Finance » What is Your Asset Allocation in 2017? One good habit to get yourself into is an, at a minimum, annual financial health check. For me, I often do a deep dive into our finances during tax season. “Thanks” to this annual tax ritual, it’s easy to evaluate our financial situation at the same time as I’ve got all of my documentation in order (read: in chaos) around me. That labor also produced this 2016 savings rate article. This includes only the liquid portion of our portfolio, broadly defined as the parts that can be moved without too much hassle. At a category level, it looks like I’ve got some knobs to turn. New contributions combined with some big successes (and a general rising tide for domestic equities) have left my portfolio with a majority of domestic stock. I expect to shift that allocation more towards overseas stocks this year. For the under-35 crowd, our 24% cash and bonds might be on the high side of desired. However, I think we’re most comfortable with somewhere between an 80/20 split and a 60/40 split. Call it a wash.
Commodities at this point are just a rounding error in our portfolio. I’m not particularly keen on commodities as investments, but I might bump that a couple percentage points. I suppose it’s possible we are caught short by massive commodity price run-ups or something, but I don’t think it’s too likely a scenario. If you do feel particularly strong one way or the other I’d love to hear your thoughts. As for real estate, we have no interest in becoming commercial or industrial landlords, so that’s why this shows up here. Outside of the obvious decline of retail, its not doing too terribly as a class – I feel comfortable with the current allocation. 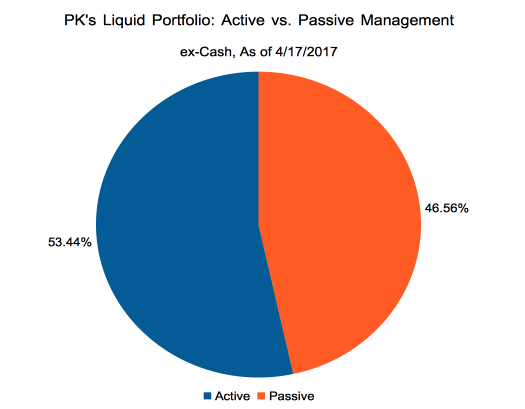 As you longer term readers know, we recommend that a generic person’s portfolio is mostly – if not wholly – passive. (See our personal finance basics article). We don’t entirely follow our own advice. I do manage some individual stocks, and some funds we hold are actively managed. If you’ve been through a few business cycles (and have studied the field) judge for yourself, but I agree: this is too much active management. I will move the needle back into passive management. That’s the sort of thing I’d only learn if I made the effort to roll up the metadata. That’s why we suggest doing the same sort of exercise on your own situation – you might find that your exposure to various things is too high or too low. Have you done a financial checkup recently? Find anything interesting? Do you disagree with any of my moves (or curious non-moves)? I do a checkup the same way you do – timed around tax time. I also have bands of acceptable ranges for asset classes. I always seem mildly surprised how a wild bull market has increased my equity %. I take that as a continued sign that I’m just not that clever. One word of caution – I think an update like this without an exhortation to use Personal Capital is blasphemous, according to the personal finance blog canon. Right? I considered dropping one in to avoid a charge of blasphemy, but I plead guilty on this point. Great article as usual! I don’t think your domestic/international equities ratio is necessarily too high. This depends on how your domestic equity is invested. If you only invest in US small caps, then you are potentially overexposed to US equity. If it is closer to S&P500, you are probably fine because those companies are inherently international. Just some food for thought. Excellent point – pretty much without exception US large caps will have a large international exposure, even if most of their reserves are denoted in dollars. Yeah, that is the case for some of my holdings, but as you guessed a fair amount of them are smaller caps. There is certainly some international revenue in the mix, but I think the conclusion stands that I’ll try to be a bit more explicit about internationalizing. This isn’t really related to this post but more related to your excellent series on Average American Net worth. Been looking at the Barron’s list of financial advisors and the typical Average Net Worth of their clients and the accounts under management. It’s really fascinating to look at by state. For example NY and CA vs WV. Could be some interesting data to play with. Thank you, those are very interesting. The problem boils down to some selection bias, though – even if say a California shows more assets under management than West Virginia, we aren’t able to say anything definitive. Some states will have a higher percentage of people with assets under management than others. We do expect to have a couple new datasets to play with on the net worth side relatively soon.